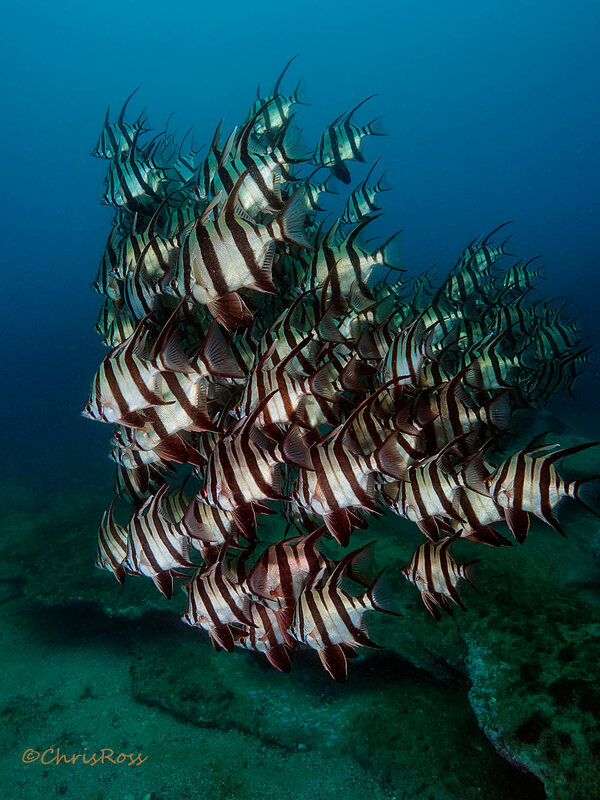 This school of Old Wives is always in the same general area on the wall at the Oak Park dive site, on this day the school was out in the open away from the wall and briefly formed this tight school formation. Olympus OM-D Em-1 MkII + 12-40mm f2.8 (@ 12mm), INON strobes, Nauticam housing. Love this. Excellent framing without cutting off a fish. Beautiful image Chris! Wonderful detail and I love the formation - like a galleon in full sail with sails taught in the wind. Beautiful image and excellent details. Awesome unique image. Really love it. Beautiful grouping and composition - a super image. Amazing dazzling patterns on these fishes. Congrats on the EP. How big are these guys? Wonderful cluster- they make such a terrific design. Sort of Escher-like.